This article is about the video rental company. For other uses, see Blockbuster. Blockbuster LLC, formerly Blockbuster Entertainment, Inc., and also known as Blockbuster Video or simply Blockbuster, is an American-based provider of home movie and video game rental services through a video rental shop, DVD-by-mail, streaming, video on demand, and cinema theater. Blockbuster expanded internationally throughout the 1990s. At its peak in 2004, Blockbuster employed 84,300 people worldwide, including about 58,500 in the United States and about 25,800 in other countries, and had 9,094 stores in total, with more than 4,500 of these in the US. Competition from the Netflix mail-order service, Redbox automated kiosks, and video on demand services were major factors in Blockbuster's eventual demise. Blockbuster began to lose significant revenue during the 2000s, and in 2010, the company filed for bankruptcy protection. The following year, its remaining 1,700 stores were bought by satellite television provider Dish Network. In November 2013, the last 300 company-owned stores were closed. While the Blockbuster brand has been mostly retired, Dish maintained a small number of Blockbuster franchise agreements, which allowed some stores to remain open. By April 2019, just one store remained open—in Bend, Oregon. Blockbuster's early beginnings can be traced back to another company, Cook Data Services, that was founded by David Cook in 1978. The company's primary goal was to supply software services to the oil and gas industries throughout Texas, but it was not very successful. Sandy Cook, David's wife, wanted to get into the video business, and her husband would soon study the industry and future prospects. Using profit he made from the sale of David P. Cook & Associates, the subsidiary of his company, he decided to buy into a video store franchise in Dallas known as Video Works. When Video Works would not allow him to decorate the interior of his store with a blue-and-yellow design, he departed the franchise and opened the first Blockbuster Video in 1985 under his own company Blockbuster Video Inc. When he realized the potential in video rentals, Cook abandoned the oil industry and began franchising the Blockbuster store. The first Blockbuster store opened October 19, 1985, in Dallas, Texas, with an inventory of 8,000 VHS and 2,000 Beta tapes. Cook's experience with managing huge databases proved helpful in driving innovation within the industry. Following early success from the company's first stores, Cook built a $6-million warehouse in Garland, Texas, to help sustain and support future growth that allowed new stores to open quickly. Blockbuster would often custom-tailor a store's inventory to its neighborhood, based on local demographics. In 1987, the company won a court case against Nintendo, which paved the way for video game rental. Also that year, Waste Management co-founder Wayne Huizenga, who originally had reservations about entering the video rental industry, agreed to acquire several Blockbuster stores. At that point the number of stores counted 19, and attracted Huizenga's associate John Melk's attention due to its efficiency, family-friendly image and business model, and convinced Huizenga to have a look at it. Huizenga and Melk utilized techniques from their waste business and Ray Kroc's model of expansion to rapidly expand Blockbuster, and soon they were opening a new store every 24 hours. They took over many of the existing Blockbuster franchise stores as well, and Huizenga even spent much of the late 1980s acquiring several of Blockbuster's rivals, including Major Video. In 1990, Blockbuster bought mid-Atlantic rival Erol's which had more than 250 stores. In 1992, Blockbuster acquired the Sound Warehouse and Music Plus music retail chains and created Blockbuster Music. In October 1993, Blockbuster took controlling interest in Spelling Entertainment Group, a media company run by television producer Aaron Spelling. Blockbuster purchased Super Club Retail Entertainment Corp. on November 22, 1993 from Philips Electronics, N.V. for 5.2 million shares of Blockbuster stock. This brought approximately 270 Record Bar, Tracks, Turtles and Rhythm and Views music stores and approximately 160 video retail superstores into the corporation. It also owned 35% of Republic Pictures; that company merged with Spelling in April 1994. Blockbuster became a multibillion-dollar company, but Huizenga was worried about how new technology could threaten their business, such as video on demand and the growth of cable television. In 1991, just three days after Time Warner had announced they would upgrade their cable system, Blockbuster's shares dropped more than 10 percent. In 1993, he made an attempt to expand into other areas by investing in Viacom. Huizenga also considered buying a cable company, but this was unknown territory for Blockbuster and he decided not to take the risk. He also had the idea of a 2,500-acre Blockbuster sports and amusement park in Florida, something Blockbuster was still considering as late as August 1994. Unable to come up with a proper solution about how to face the growing threats to the traditional videostore, he made the decision to sell Blockbuster to Viacom and pull out. Viacom acquired Blockbuster in 1994 for $8.4 billion to help finance its bid for Paramount in the bidding war with QVC Network Inc. Blockbuster's stock trade had been dropping steadily the months before the merger, with a small rise after the deal was announced, and three years later, in 1997, it's worth was estimated to just $4.6 billion. The Blockbuster Block Party concept was test-marketed in Albuquerque, New Mexico, and Indianapolis, Indiana, in 1994. It was an "entertainment complex" aimed at adults, containing eight themed areas housing a restaurant, games, laser tag arena, and motion simulator rides, and was housed in a windowless building the size of a city block. During the 1990s, Blockbuster expanded in the United Kingdom, purchasing that country's Ritz Video chain. The stores were rebranded to Blockbuster, making it the number one UK rental chain. The original Blockbuster company, Blockbuster Video Inc., was merged into the parent company Blockbuster Entertainment Inc. which replaced the Blockbuster Entertainment Company earlier. In 1996, Blockbuster Entertainment Inc. merged into a new Blockbuster Entertainment Corporation and the retail stores, then called Blockbuster Video, were renamed Blockbuster. The logo changed slightly, but retained the ITC Machine font. In November 1996 Blockbuster confirmed that it was moving its headquarters from Fort Lauderdale, Florida to the Renaissance Tower in downtown Dallas. Most of the workers at the Florida headquarters did not want to relocate, so Blockbuster planned to hire around 500 to 600 new employees for its Dallas headquarters. The company had offered various relocation packages to all of its Fort Lauderdale staff. The second Blockbuster Entertainment Corporation was later merged into Blockbuster, Inc. In 1998, Blockbuster created DEJ Productions, which acquired 225 films primarily to provide exclusive content to its Blockbuster stores prior to being sold off to First Look Studios in 2005. During that same year, Blockbuster bought the Irish video rental store Xtra-vision, with over 200 stores in Ireland and the UK. 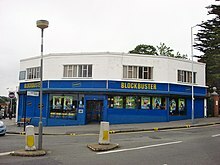 In 2009, Blockbuster sold off its Irish operations to Birchall Investments, with the few Xtra-vision stores in the UK being rebranded as Blockbuster. In 1998, when DVDs were emerging as the new video medium, Warner Bros. offered CEO John Antioco an exclusive rental deal. Blockbuster would have rights to rent new DVD releases for a period of time before they went on sale to the general public. The studio would receive 40% of rental revenues in return, which was the same deal already in place for VHS rentals. Blockbuster turned the offer down, and the studio responded by lowering their DVD wholesale price in order to compete with the rental industry. Walmart seized the opportunity and in a few years surpassed Blockbuster as the studios' single largest source of revenue. Other mass retailers soon followed suit. Many began selling DVDs below wholesale price in hopes of selling more items with better profit margins as a result of the additional foot traffic in their stores. Unable to match prices, Blockbuster's business model was severely impacted. 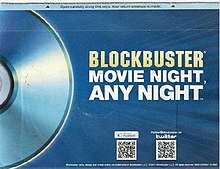 In late 1998, Blockbuster launched a loyalty program called Blockbuster Rewards that allowed customers to earn free rentals, including one older title each month from the category of Blockbuster Favorites. After the 1998 test launch, the chain went nationwide with the program in 1999. In August the same year, Viacom sold the Blockbuster Music chain to Wherehouse Entertainment, which was subsequently purchased by Trans World Entertainment in 2003. In mid-2000, the company partnered with Enron in an attempt to create a video-on-demand service. The agreement was supposed to last for 20 years, however, Enron terminated the deal in March 2001 over fears that Blockbuster would not be able to provide sufficient films for the service. Also in 2000 Blockbuster turned down a chance to purchase the fledgling Netflix for $50 million. In 2002, Blockbuster acquired Movie Trading Company, a Dallas chain that buys, sells, and trades movies and games, to study potential business models for DVD and game trading. Also that year, it acquired Gamestation, a 64-store UK computer and console games retailer chain, and purchased DVD Rental Central for $1 million, an Arizona father-and-son online DVD-rental company with about ten thousand subscribers. DVD Rental Central would eventually become Blockbuster Online. In October 2004, Blockbuster was spun-off from Viacom. Online DVD subscription was introduced on Blockbuster.com, also known as Blockbuster Online. Blockbuster also rolled out its "Game Rush" store-in-store concept to approximately 450 domestic company-operated stores. Blockbuster began game and DVD trading in selected U.S. stores. At its peak in 2004, Blockbuster had more than 9,000 stores in the U.S. In December 2004, Blockbuster announced its intention to pursue a hostile takeover of Hollywood Video, its major U.S. competitor. After several extensions of the tender offer, Blockbuster withdrew due to FTC opposition. To counter the Blockbuster offer, Hollywood Video agreed to a buyout in January 2005 by a smaller competitor, the Dothan, Alabama-based Movie Gallery. Since then, Movie Gallery has filed for bankruptcy twice and its entire chain of stores has been liquidated. In May 2005, financier Carl Icahn waged a successful proxy fight to add himself and two other members to the board. Icahn accused Blockbuster of overpaying chairman and CEO John F. Antioco, who had served in that capacity since 1997, receiving $51.6 million in compensation for 2004. Icahn was also at odds with Antioco on how to revive profit at Blockbuster. Antioco scrapped late fees in January, started an internet service, and decided to keep the company independent, while Icahn wanted to sell out to a private equity firm. Also in 2005, Blockbuster began a campaign promoting its "No more late fees" policy . The campaign proved controversial with Associated Press reporting that the new policy actually charged users the full price of the movie or game after eight days which they could cancel by returning the product in question and paying a fee. More than 40 states filed suit against the company for false advertising. Blockbuster later settled the suit by agreeing to refunds as well as promising to better explain the policy. In 2006, Vintage Stock acquired the Movie Trading Company name from Blockbuster and continues to use the name for Dallas-area stores. A billion-dollar campaign called Total Access was introduced in 2007 as a strategy against Netflix. Through Blockbuster Online customers could rent a DVD online and receive a new movie for free when they returned it to a Blockbuster store. While it was a major success every free movie cost the company two dollars, but the hope was that it would attract enough new subscribers to cover the loss. Netflix felt threatened, and Hastings approached Antioco with a suggestion to buy Blockbuster's online business. In return, a new system would be introduced where customers could return their movies to a Blockbuster store. Before the deal could be realized, board member Carl Icahn intervened, refusing to let the company lose more money through Total Access. Antioco was pushed out in July and replaced with James Keyes, who rejected Hasting's proposal, raised the price of online DVD rentals and put an end to the free movie deal. As a consequence, Blockbuster Online's previously massive growth quickly stopped. Antioco's departure reportedly also involved continued controversy over his compensation. He left with a $24.7 million severance package. On June 19, 2007, after a pilot program launched in late 2006, Blockbuster announced that it had chosen Blu-ray over HD DVD format to rent in a majority of its stores. In the pilot program, Blockbuster offered selected titles for rental and sale in 250 stores. Blockbuster stocked Blu-ray titles in almost 5,000 stores across the United States, Canada, the United Kingdom, Mexico, and Australia. On July 2, 2007, the company named James W. Keyes, former president and CEO of 7-Eleven, as the new chairman and CEO. He introduced a new business strategy that included enhancements to existing stores along with a shift to streaming video with the acquisition of MovieLink in September 2008. Part of the plan was to de-emphasize the unprofitable Total Access (DVD-by-mail) service, in favor of online streaming. In December 2008, he still ignored both Netflix and Redbox, focusing on Apple and Walmart instead; "Neither RedBox nor Netflix are even on the radar screen in terms of competition. It's more Walmart and Apple." On September 14, 2007, Blockbuster GB Ltd bought a number of retail stores from ChoicesUK plc. ChoicesUK is an AIM-listed multi-channel distributor and retailer of DVDs, computer games, and CDs. The sale secured employment for approximately 450 employees across 59 stores in the UK. As part of the transaction, Blockbuster GB rebranded the stores as Blockbuster. On February 17, 2008, Blockbuster proposed a buyout of struggling Circuit City. However, after a due diligence review of Circuit City's financial books, Blockbuster withdrew its offer in July 2008. Analysts were not favorable to the proposed deal, viewing it as a desperate effort to save two struggling retailers rather than a bold turnaround initiative. Subsequently, Circuit City filed for bankruptcy on November 10, 2008 and, after liquidating all of its stores, ceased operations on March 8, 2009. At the beginning of 2010, Blockbuster had over 6,500 stores, of which 4,000 were in the U.S., a number that had been reduced to 3,425 in late October the same year. In the United States, it planned to close between 810 and 960 retail stores and instead launch as many as 10,000 "Blockbuster Express" video rental kiosks by the middle of 2010. It has been claimed that more than 43 million U.S. households had Blockbuster memberships. On February 10, 2010, Blockbuster announced that it would cease all its operations in Portugal, closing down 17 outlets and leaving over 100 workers unemployed. Blockbuster representatives in Portugal blamed internet piracy and the lack of government response to it as the key factors to the company's failure in the country. In March 2010, Blockbuster began "Additional Daily Rates", or "ADRs", for rentals not returned by their due date in the United States, having already used this procedure in other countries such as the UK for many years. An ADR was charged for each day a member kept the rental beyond the rental terms. On March 12, 2010, PricewaterhouseCoopers, Blockbuster's independent registered public accounting firm, issued its audit opinion disclosing substantial doubt about Blockbuster's ability to continue as a going concern. This report was included in Blockbusters's 10-K SEC filing. On March 17, 2010, Blockbuster issued a bankruptcy warning after continued drops in revenue threatened its ability to service its nearly $1 billion debt load. By April 1, 2010, Carl Icahn had resigned from Blockbuster's board of directors and sold nearly all his remaining Blockbuster stock. Blockbuster paired up with Time Warner to have Warner Bros. movies made available in Blockbuster stores on the DVD release date and not be subject to a four-week delay. Similar agreements were also made with Universal and 20th Century Fox. In May 2010, the liquidation of Movie Gallery began, eliminating Blockbuster's primary competitor. During the same month, a dissident shareholder, Gregory S. Meyer, in an effort to be elected to Blockbuster's board of directors, engaged in a proxy battle with Blockbuster's board, alleging that the board had been responsible for significant destruction of value to shareholders. Meyer was elected to the board at Blockbuster's shareholder meeting in Dallas on June 24, 2010. On July 1, 2010, the company was delisted from the New York Stock Exchange after its shareholders failed to pass a reverse stock split plan aimed at heading off involuntary delisting because of the stock's trading at well below $1 per share. The stock was then traded on the OTCBB (over-the-counter bulletin board). Blockbuster was unable to make a $42.4 million interest payment to bondholders and was given until August 13, 2010 to pay off the debt. The company hired Jeff Stegenga to be its chief restructuring officer (CRO) in an effort to satisfy bondholder demands and recapitalize the company. After failing to pay on August 13, bondholders gave Blockbuster until September 30, 2010. On August 26, 2010, news media reported that Blockbuster was planning to file a pre-packaged Chapter 11 bankruptcy in mid-September. In light of this news, the company's chief financial officer (CFO), Tom Casey, resigned on September 11. He was replaced by Dennis McGill, formerly CFO of Safety-Kleen Systems, Inc. On September 23, 2010, Blockbuster filed for Chapter 11 bankruptcy protection due to challenging losses, $900 million in debt, and strong competition from Netflix, Redbox, and video on-demand services. Movie Gallery/Hollywood Video had filed for Chapter 7 bankruptcy liquidation earlier in 2010 for similar reasons. At the time of its Chapter 11 filing, Blockbuster said it would keep its 3,300 stores open; In December 2010, Blockbuster announced it would close an additional 182 stores by the end of April 2011 in attempts to emerge from bankruptcy. It was reported in February 2011 that Blockbuster and its creditors had not come up with a Chapter 11 exit plan and that the company would be sold for $300 million or more, along with taking over debts and leases. Blockbuster has admitted that it may not be able to meet financial obligations required under its Chapter 11 filing, a circumstance which could mandate conversion of the bankruptcy filing to Chapter 7 (liquidation). On March 1, 2011, the U.S. Department of Justice filed a claim disclosing that Blockbuster did not have the funds to continue reorganizing and should liquidate. On March 28, 2011, South Korean telecommunications company SK Telecom made a surprise bid to buy Blockbuster.Dish Network had also expressed interest in bidding, as did Carl Icahn, despite calling Blockbuster "the worst investment I ever made". Dish eventually won the auction on April 6, 2011, agreeing to buy Blockbuster for $320 million and the assumption of $87 million in liabilities and other obligations. On April 19, 2011, it was announced that Dish would keep only 500 Blockbuster stores open. The acquisition was completed on April 26, 2011. In April 2011, Dish Network told the U.S. Bankruptcy Court that it needed more time to negotiate with landlords in an effort to keep more than 600 Blockbuster stores open. In April 2011, Blockbuster's landlords objected to its assumption of leases that it sought to assign to soon-to-be-owner Dish Network Corp., claiming that they did not have adequate assurance that the new owner would honor those leases. Blockbuster signed a deal with ITV Studios Global Entertainment to launch ITV Programmes released on DVDs, Blu-rays, etc. Former Blockbuster store in the Midwest. On May 6, 2011, Keyes resigned as Blockbuster's CEO, being replaced by Michael Kelly under the new title of president. On August 31, 2011, the liquidators announced the closure of the remaining 253 Canadian stores and shutting of the entire Canadian unit. In September 2011, it was announced that Blockbuster and Dish Network would launch a new service called Blockbuster Movie Pass that would compete with Netflix. For US$10 per month the members would have access to both a streaming service and movies and games-by-mail. The package was only available for subscribers of Dish Network's pay-TV service, and it eventually folded. On January 13, 2012, Dish CEO Aaron Kask announced that while Dish had planned to keep 90% of the stores in operation, meaning around 15,000 employees would remain employed, because of market factors "there are ones that aren't going to make it. We will close unprofitable stores. We will close additional stores." Kask did not say when these additional closings would happen and only remarked that some stores were unprofitable. The Dish chief would not say which stores the company was planning to close, but that each potential closing was to be assessed on a "case by case basis". On October 4, 2012, Dish Network announced that it was scrapping plans to make Blockbuster into a Netflix competitor. On January 16, 2013, Blockbuster UK entered into administration and Deloitte was appointed to run the business while trying to find a buyer while some of the stores remained open. Between November 6, 2013, and January 12, 2014, all 300 remaining corporate-owned Blockbuster stores in the U.S. were closed and the DVD-by-mail program was shut down. The Blockbuster official website identified 51 franchise locations remaining in operation in the U.S. in 2014. The company maintained its Blockbuster on Demand video streaming service along with a Blockbuster@Home television package for Dish Network subscribers until 2015, when both were replaced by DISH Movie Pack. The company's continued decline was attributed to poor leadership according to others in the industry. Ken Tisher, owner of one of the few remaining Blockbuster stores, said, "Blockbuster, if it isn't already, is going to go into the Harvard Business Review for how not to run a business, or how to run a business into the ground." Keith Hoogland, owner of Family Video, said a lot of poor decisions was a primary reason the company did not survive. Dan Rayburn of StreamingMedia.com stated that "everything about Blockbuster was set up to fail". Jonathan Salem Baskin, a former Blockbuster marketing communications executive, said, "Digital would have changed Blockbuster's business, for sure, but it wasn't its killer. That credit belongs to Blockbuster itself." Additional store closures would continue. By January 2018, the company's website listed nine remaining franchise-owned stores in the U.S., including six in Alaska, two in Oregon, and one in Texas. By August 2018, eight of those nine had closed, leaving only one U.S. store in Bend, Oregon. At the end of March 2019, the last Blockbuster in Australia, in Morley, Western Australia, was closed, leaving the store in Bend, Oregon, the only one remaining in the world. The Bend store houses Russell Crowe movie props which John Oliver had donated to an Alaska store. A documentary is currently in production by two Bend filmmakers whose goal is to get it "on the shelf at Blockbuster while there still is one." The standard business model for video rental stores had traditionally been to pay a large flat fee per video, approximately $65, and offer unlimited rentals for the lifetime of the medium itself. Sumner Redstone, whose Viacom conglomerate then owned Blockbuster, personally pioneered a new revenue-sharing arrangement for video in the mid-1980s. Blockbuster obtained videos for little cost and kept a 60% of the rental fee, paying the other 40% to the studio, and reporting rental information through Rentrak. In addition to benefiting from a lower initial price, Blockbuster also capitalized on the fact that movies were generally not available for purchase at affordable price points during initial release periods. Thus customers had a choice to rent, wait, or buy the film on tape at the much higher manufacturer's suggested retail price targeted at other rental chains and film enthusiasts, which at that time ranged between $70–$100 per title. Blockbuster stores followed a strategy of emphasizing access to the most popular new releases, obtaining early access and stocking many copies of the new-release titles, with a relatively smaller depth of selection than traditional independent video stores. Much of the shelf space in the stores was devoted to popular titles that were placed relatively sparsely on the shelves with the entire front cover visible, so customers could browse casually and quickly, rather than having a more diverse selection with fewer copies of each title. Blockbuster sometimes contracted with studios to obtain earlier access to new titles than other companies could achieve. Examples of such contracts were those in which Blockbuster became the exclusive rental chain for new releases from the World Wrestling Federation (now known as WWE), Paramount, DreamWorks, Universal Studios, The Weinstein Company, Miramax, Lionsgate, Disney, 20th Century Fox, MGM, Sony, Image Entertainment, Warner Bros., New Line Cinema and Allumination FilmWorks. As one commentator complained, "Blockbuster was once an unstoppable giant whose franchises swept across the country putting mom and pop video stores out of business left and right by offering a larger selection of new releases, pricing them at a lower point due to the volume they worked in... Gone were the fragmented, independently owned shops that were often unorganized treasure troves of VHS discoveries. In their place were walls of new releases: hundreds of copies of a small handful of films. Everyone watching the same thing, everyone developing the same limited set of expectations... They put focus entirely on what was new rather than on discovering film history ..."
When a title was no longer a new release, each store would retain a few copies of it and typically sell off the rest as "previously viewed" for discounted prices. Older movies would be re-categorized as "Blockbuster Favorite" titles and placed in a different area of the store. Most Blockbuster locations also accepted trade-ins of used movies, TV shows, and games. Since Blockbuster's founding in 1985, the chain refused to stock adult films in order to portray the brand as family-friendly. However, the company did carry R-rated and unrated films. Blockbuster Entertainment Inc. ran an awards show annually from 1995 to 2001 called the Blockbuster Entertainment Awards. In November 2001, Blockbuster announced that it would cancel the 2002 award show following concerns about viewership and celebrity attendance after the September 11 attacks. Blockbuster Express was a movie-rental kiosk brand sublicensed for use by licensee NCR Corporation. In 2011, nearly 10,000 Blockbuster Express kiosks were in operation. Apart from the license to use the Blockbuster brand name, Blockbuster Express kiosks are unrelated to Blockbuster LLC, its stores, its DVD-by-mail service, or its online streaming service. The names Blockbuster Express and Blockbuster Video Express had also been used for certain Blockbuster retail stores in the United Kingdom. In the summer of 2003, Blockbuster started converting some stores to GameRush stores. These stores sold and bought DVDs, games, game consoles, and accessories. GameRush was positioned as a direct competitor to stores such as GameStop and Game Crazy. Blockbuster used its location status to get instant coverage; it also promoted these stores by hosting video-game tournaments, special trade-in offers, and a more "hip" look to the selection and staff. However, when Blockbuster introduced the discontinuation of late fees, GameRush was put on the chopping block. In April 2007, GameRush stores were reduced back to just a games section. In 1993, Blockbuster invested in the indoor kids play restaurant Discovery Zone. In 1995, Blockbuster bought more stock to take control of the company. The Discovery Zone chain closed in 1999. In Australia, the first Blockbuster store was opened in 1991 in Melbourne. In 1992, the Virgin Group and Blockbuster Inc entered into a joint venture to set up Australia's first Virgin Megastores in Sydney, Melbourne, and Adelaide. This lasted until Virgin sold its interest in the six stores to Blockbuster, which promptly rebranded them in 1993 as Blockbuster Music. In 1994, Australian store numbers rose to 54 with the acquisition of Major Video and Focus chains in both Victoria and South Australia. In 1995, the growth continued with the opening of the 100th video store in the country. By the end of 1998, Blockbuster Australia opened over 125 stores. 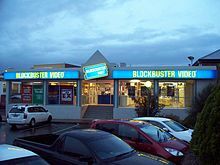 In July 1998, Blockbuster Australia launched into franchising with the conversion of the former Video Flicks franchise group in Queensland, and the former Movieland group in Western Australia six months later. Also in 1998, the company sold its last two Australian Blockbuster Music stores in Pitt Street, Sydney, and Chapel Street, Melbourne to Brazin Limited, which incorporated them under its Sanity Entertainment brand. Throughout 1999 and 2000, Blockbuster Australia quickly expanded its franchise store network through the conversion of smaller groups and the granting of individual franchises. Before 2005, this was done through the acquisition of the Movies Plus Group and the conversion of some individual Movies 4U and Movieland outlets. In February 2007, Blockbuster sold its entire Australian store network to Video Ezy Australasia Pty Ltd. At the time, Blockbuster Australia comprised 370 outlets nationwide—29 owned by the company and 341 owned by franchisees. Video Ezy had 518 Australian outlets, all of them being owned by franchisees, pushing the combined group's market share to 40% of the country's video rental sector. Video Ezy committed to the master franchise agreement with Blockbuster for 10 years operating the brand with the possibility of renewal for a further 10 years after that. As a consequence of the deal, the company changed its name from Video Ezy Australasia Pty Ltd to Franchise Entertainment Group (FEG). In October 2010, FEG transferred control of the Video Ezy Australia and Blockbuster Australia online businesses to its newly acquired and reorganized company, Élan Media Partners, leaving FEG to manage the franchise relationships with individual Video Ezy/Blockbuster outlets. However, since the two brands came together, the network has shrunk, reflected in Video Ezy/Blockbuster franchises closing 270 stores across Australia in the four years to August 2011. In 2017, there were only 12 outlets, in addition to about 70 automated booths, left in Australia. Additional store closings would go on for several years , until all the stores in Australia had closed, although vending kiosks with the Blockbuster logo were in operation. The last Blockbuster in Australia was in Morley, Western Australia, which closed at the end of March 2019. Blockbuster was the largest video rental chain in the country, but finances were not good enough due to high rental prices. Lojas Americanas, the largest Brazilian department store, acquired half of the shares and now it is named under "Americanas Express Blockbuster". The store layout was similar to a regular American store with a Game Rush, but instead of games it offers electronics goods like computers and DVD players, groceries like candies and microwave popcorn, and even toys from Mattel and Hasbro's board games. In January 2007, when Blockbuster had 127 stores across Brazil, it sold its Brazilian stake for $87.4 million and gave Lojas Americanas exclusive rights to the Blockbuster brand in the country for 20 years. The average store has an interior on about 400 m2, where 80-100 m2 is dedicated to movies. In Canada, Blockbuster Canada (established in 1990) had operated independently, and it initially remained financially stable. It began a partnership with Wind Mobile in December 2009, selling mobile phones at all stores in cities where Wind's service was available. Phone sales began in Toronto and Calgary, later expanding to other cities with Wind coverage. Some stores even featured a full Wind "store-in-a-store" for postpaid activations and a larger selection of devices. However, on May 3, 2011, it was announced that the company had gone into receivership. On May 25, 2011, it was announced that 146 stores, accounting for approximately 35% of the company's stores in Canada, would be shut down effective June 18, 2011. On August 31, 2011, Blockbuster Canada announced that no buyer could be found for its remaining stores that were acceptable to the court-appointed bankruptcy receiver, and that it would wind down operations and close all stores by December 31, 2011. The company had acted as a guarantor towards Blockbuster's remaining debt. However, the Blockbuster On Demand service is still active in Nordic Countries, offering both unlimited streaming and 48-hour rental of films online. Several Smart TVs have the Blockbuster app pre-installed out-of-the-box, and it is available on a variety of streaming devices such as Google's Chromecast. Blockbuster opened 20 stores in Berlin and Munich and announced plans to open 250 more.[when?] The chain presented itself as family friendly by not renting pornographic films. However, that decision left a gap in the profitability of the stores. Blockbuster left the German market in 1997. In 1998, after the closure of KPS Video Express, Blockbuster saw an opportunity to enter into the Hong Kong market, and entered into negotiations with KPS's receivers Ernst and Young to buy their operations. Blockbuster re-opened 15 out of 38 former KPS stores by February 16, 1998,  and re-employed 145 former KPS staff. KPS members were given special offers to join Blockbuster, but the video pre-paid coupon system was not retained. Blockbuster pulled out of the market in 2004 after high operating costs and losses to copyright infringement. In March 2010, Blockbuster announced that it intended to sell all operations in Europe. The company once had an Irish subsidiary, Xtravision, which did not operate under the Blockbuster brand name. Blockbuster sold Xtravision at a loss in August 2009 to Birchhall Investments Limited. In early 2016 it was decided to close all of its 83 stores except for its online business and vending machines. In the late 2000s at its peak, Blockbuster Israel had 40 branches and more than 260 automated video rentals. In December 2011, Blockbuster closed off its last branch store, and had only 80 automated video rentals left. In March 1991, Fujita Den Trading (which was the master franchise owner of McDonald's in Japan) and Blockbuster Inc entered into a joint venture to established Japan's first Blockbuster Video stores. By October 1992, Fujita and Blockbuster opened 15 stores in the country – four of them next to McDonald's outlets and most being located in the greater Tokyo area. Unlike Blockbuster's U.S. stores, each Japanese outlet only occupied about half the floor space at 5,000 square feet due to the country's more limited available real estate. By June 1996, 32 stores were in operation with a public aim for 150 by 1998. Blockbuster Japan faced heavy competition from Osaka-based video rental chain, Tsutaya, with its 817 outlets, but the company saw opportunity in the population having high VCR ownership levels (at around 75%), low satellite TV penetration (at around 27%), and well-ordered store layouts (unique for most local video stores). However, Blockbuster's business strategy of "wholesome home entertainment" saw it not stock adult entertainment or extreme horror films where they account for 35% of the Japanese video market. That meant Blockbuster was unable to fit into the Japanese market adequately and was put at a disadvantage to other businesses selling and renting these movies. In 1999, Blockbuster handed its remaining shares over to Fujita Den Trading and exited the Japanese market. In September 2015, all remaining Blockbuster retail stores (263 in total) in Mexico had been converted to "The B Store", and the floor space dedicated to video rentals reduced from 70% to 20%, the remaining space being used for general technology and electronics sales. The re-branding occurred with the owners not renewing their license with Blockbuster and the imminent expiry of the existing license. All remaining B-stores closed by July 2016. The chain also operated for many years in New Zealand, but all stores there have closed. In December 2002 the first Blockbuster store opened in Norway, and was followed by another store some months later in 2003, both located in Oslo. The hope was to acquire an already existing video chain. When that failed, it was made an attempt to build a Norwegian blockbuster chain from scratch. But both stores closed in the spring of 2004. In 2007, Blockbuster announced that it plans to shut down its stores in Peru due to poor revenues, which it blamed on the effect of movie piracy. The company had already closed down its stores in Ecuador, Portugal and Costa Rica. El Salvador followed in 2010, and Argentina in 2011. In 1989, the company entered the United Kingdom via its purchase of the 875-store Ritz Video chain for $135 million, from parent company Citivision. Ritz Video was Europe's largest rental chain, with a 20% share of the United Kingdom video market, and annual sales of about $150 million. The first re-branded Blockbuster outlet opened on Walworth Road, South London, the same year. By November 1991, Blockbuster UK converted 30 stores to its brand. Blockbuster UK operated trade functions in all their stores, buying and selling pre-owned DVDs, console games, and gaming accessories. Stores offered either store credit or cash for trade-ins, and would price-match with competitors. At its height in 2002, Blockbuster UK operated out of over 800 stores. In early 2013, the company had 528 locations in the United Kingdom. On January 16, 2013, Blockbuster placed its United Kingdom subsidiaries in administration, putting over 4,000 jobs at risk. Non-UK stores were unaffected by the administration, and continued to trade as normal. On February 1, 2013, a large number of Blockbuster stores in the UK were closed, and the UK business was purchased out of administration by restructuring firm Gordon Brothers Europe on March 23, 2013. Blockbuster UK then traded as TS Operations, with only 264 branches retained. On October 29, 2013, Blockbuster UK announced it was to go into administration for a second time. On November 14, 2013, 72 store closures were announced, with another 62 made on December 5. A week later, with no success in finding a buyer, it was announced by Moorfields Corporate Recovery that all remaining stores in the country would cease operation on December 16, 2013, with stock cleared the day before. In September 2018, to coincide with the digital release of Deadpool 2', a pop-up retail store in the style of an original 1989 Blockbuster outlet was opened for two days in Shoreditch in East London. The store gave away 1,989 copies of the film in reference to Blockbuster's entry year into the British market. In 1997, Enron Corporation had entered the broadband market, constructing and purchasing thousands of miles of fiber optic cables throughout the United States. In 2001, Enron and Blockbuster Inc. attempted to create a 20-year deal to stream movies on demand over Enron's fiber optic network. However, the "heavily promoted" deal fell through, with Enron's shares dropping following the announcement. On August 11, 2004, Blockbuster introduced a DVD-by-mail service in the U.S. to compete with the established market leader, Netflix. Blockbuster's U.S. online operation started with around 10 warehouses; further expansions every year brought that number to 41, plus more than 1400 stores in the Blockbuster Online network. Most Blockbuster independent franchises did not honor the Total Access program. The company had 1.5 million subscribers at the end of the third quarter of 2006. Blockbuster's move to follow the business pattern with its online rentals as was established by Netflix prompted Netflix to sue Blockbuster for patent infringement. Blockbuster counter sued with a counterclaim alleging deceptive practices with its patent which it alleged was designed to maintain an illegal monopoly. The suits were eventually settled, and while the terms were not disclosed it was later reported that Netflix recorded a settlement payment from Blockbuster of $4.1 million in the second quarter of 2007. Blockbuster offered several online movie rental plans. In some cities customers could add games to their movie rental queue as if they were included in their plan, but game rentals resulted in a separate additional fee which was not displayed or charged until the end of the billing cycle. Until July 26, 2007, Blockbuster offered and advertised unlimited free in-store exchanges of online rentals with all plans. Since then there were several changes back and forth with regard to this policy; in March 2010 customers were allowed a limited number of in-store exchanges. At the end of 2006, Blockbuster Total Access had 2.2 million customers, exceeding their original goal of 2 million, according to its website. After an aggressive media campaign that accounted for much of Blockbuster's $46.4 million net loss in the first quarter of 2007, the Total Access subscriber base surpassed 3 million customers in total, marking the company's highest subscriber growth quarter ever. By 2009, however, the company was declining to provide figures when asked by The Wall Street Journal. On January 5, 2007, Southern Stores Inc., one of Blockbuster's largest franchise operators in the United States, filed a lawsuit in federal court alleging that, by introducing Blockbuster Online and Blockbuster Total Access, the rental chain has undercut the group's franchise agreement. On August 6, 2010, Blockbuster By Mail subscribers gained access to Blockbuster's library of console games, in addition to movies and television shows. On March 31, 2012, Blockbuster On Demand removed support from set-top box media players, including Vudu, WDTV, and Roku. Supported devices now only include computers, Blu-ray players, select television sets, and cellular phones. On February 26, 2013, Roku, Inc. announced that Blockbuster On Demand was being launched on Roku's channel store. Supported devices now include computers, Blu-ray players, select television sets, cellular phones, and the Roku set-top box. In November 2013, Dish Network said its DVD-by-mail service would shut down by mid-December. Rentals cost £3.50 to £4.50 and lasted for five nights, usually from Monday to Friday due to the postal service. Late fees of £0.70 to £0.90 per disc applied if a disc was not returned on time. In May 2004, Blockbuster also introduced an online subscription service. The unlimited three-disc plan cost £14.99/month but did not allow in-store exchange, contrary to the U.S. service. Partial support for in-store exchange was added in April 2005 with the launch of an "OnlineXtra" service. This service cost £2 per month, required an online subscription to a disc plan, and added two extra discs sent by mail. The OnlineXtra discs could be exchanged in store, but the non-OnlineXtra discs could not. The program was discontinued in 2006 with no grandfathering, but an in-store-only variant of it resurfaced in early 2008. A "Click & Collect" service launched in September 2010 allowed the reservation of Blockbuster movies in store, but the store's regular rental fees applied until the company added in-store exchanges in May 2012. Support for game reservations was added in November 2011. In 2008, Blockbuster UK's website underwent an overhaul, with an online store; a retail store stock checker; improved search functionality; and a critically acclaimed layout. In-store pickup and exclusive titled were added in 2009. Some of the titles which had an exclusivity period at Blockbuster include Gran Torino, Changeling, Taken, and Knowing. Additionally, online rental downloads of Universal Pictures in the United Kingdom remains exclusive to Blockbuster. This provides an advantage to the rental company compared to its competitors HMV, Play, and LoveFilm. In January 2010, Blockbuster UK launched an online blog. Improved search algorithms, product pages, and social network links were added to the site in April 2010. Blockbuster UK aired a monthly BB Insider online video show from May 2010 to January 2011 and launched an iPhone App in September 2010. Throughout the year 2011, Blockbuster UK announced several price cuts along with a new Blockbuster loyalty card program. These price drops were followed by a price drop of the Blockbuster UK online pay per rent service. Although some Blockbuster UK advertisements claim that the company no longer charges late fees, the fine print and/or voiceover clarifies that rentals will be charged an extra pound for every additional night. A "Top Ticket" feature was added in April 2011, allowing monthly subscription customers to rent an additional movie at no extra charge and to receive it before other movies they request. Support for online sales of used movie and game discs was added in July 2011. The Blockbuster UK website was enhanced in September 2011. During the following month, a new TV section was added to the website. 3D Blu-rays were added to Blockbuster UK in February 2012. In May 2012, Blockbuster UK partnered with IGN to launch a new Blockbuster VIP Gamer loyalty program. On January 16, 2013, Blockbuster UK entered administration, appointing Deloitte as company administrators, casting doubt over the future of their 528 stores in the country. An announcement was then made by Deloitte that 160 UK stores would close. On February 13, 2013, Deloitte announced a further 164 stores closures, leaving 204 stores trading in the UK. The business was sold to restructuring firm the Gordon Brothers Group on March 23, 2013. On October 29, 2013, Gordon Brothers filed notice of intention to appoint an administrator. On November 28, 2013, Blockbuster UK officially entered administration for the second time, and by December 2013, all stores were closed, as no buyer for the chain was found. On August 8, 2007, Blockbuster announced that it reached an agreement to purchase Movielink. According to the 8-K filing by Blockbuster, the total purchase price was $6.6 million. One of Blockbuster's most well known advertising campaigns was launched during the 2002 Super Bowl. It starred the voices of Jim Belushi and James Woods as Carl and Ray, a rabbit and a guinea pig in a pet shop located across the road from a Blockbuster store. The first campaign ended in 2003. The Carl and Ray campaign started again in 2007 starting with a commercial in the first quarter of Super Bowl XLI. In 2005, Blockbuster launched a marketing campaign describing changes in its late fees policy and offering "No Late Fees" on rentals. The program sparked investigations and charges of misrepresentation in 48 states and the District of Columbia, as state attorneys general including Bill Lockyer of California, Greg Abbott of Texas, and Eliot Spitzer of New York argued that customers were being automatically charged the full purchase price of late rentals and a restocking fee for rentals returned after 30 days. In a settlement, Blockbuster agreed to reimburse the states the cost of their investigation, clarify communication to customers on the terms of the program, and offer reimbursement to customers charged fees prior to the clarification. New Jersey filed a separate lawsuit and was not a party to the settlement. The 2005 controversy came after a related lawsuit settled in 2002 in Texas. That lawsuit, alleging exorbitant late fees, led the company to pay $9.25 million in attorney fees and offer $450 million in late fee refund coupons (which were rent-one get-one-free coupons, and thus required the customer to make an initial expenditure). The company estimated that the coupons would ultimately cost about $45 million depending on the redemption rate; an attorney for the plaintiffs estimated the final cost at closer to $100 million at a redemption rate of about 20% (calculated based on a similar case in Michigan). Such corrections were also sent to international stores such as those in Canada to prevent further lawsuits. Blockbuster reintroduced late fees in the United States in 2010 under the name of "Additional Daily Rates". With this pricing scheme, rentals were once again limited to a certain number of days and accrued pay-per-day rates after the days allocated are exceeded. ^ "Blockbuster releases IPO". CNNMoney. August 10, 1999. Retrieved March 27, 2018. ^ "Blockbuster Stock Trading Halted". The Street. July 1, 2010. Retrieved March 27, 2018. ^ a b c d e f Hyatt, Joshua (July 1, 2003). "He Began Blockbuster. So What? David Cook created a household name, but he refuses to become one". CNN Money. Retrieved January 23, 2014. ^ a b "Blockbuster's Entertainment Store!". website home page. Wayback Machine. December 24, 1996. Archived from the original on October 25, 2013. Retrieved November 7, 2013. Blockbuster name, design and related marks are trademarks of Blockbuster Entertainment Inc. © 1987, 1996 Blockbuster Entertainment Inc. All Rights Reserved. Developed by Blockbuster Technology – Online Group and Viacom Interactive Services. ^ Stephen, Bijan (2018-08-29). "The last Blockbuster: what we really lose when video stores shut down". The Verge. Retrieved 2019-04-19. ^ "Blockbuster opening Mexico multiplex". IMDb. ^ "The Sad End Of Blockbuster Video: The Onetime $5 Billion Company Is Being Liquidated As Competition From Online Giants Netflix And Hulu Prove All Too Much For The Iconic Brand". International Business Times. December 5, 2013. ^ a b Clifford, Stephanie (April 8, 2011). "Other Retailers Find Ex-Blockbuster Stores Just Right". The New York Times. ^ "Form 10-K". www.sec.gov. Retrieved June 7, 2017. ^ "Blockbuster to end late fees in 2005". December 14, 2004. Retrieved July 13, 2018. ^ "Blockbuster LLC Chapter 11 Petition" (PDF). PacerMonitor. PacerMonitor. Retrieved May 9, 2016. ^ "Blockbuster Reaches Agreement on Plan to Recapitalize Balance Sheet and Substantially Reduce its Indebtedness" (Press release). Blockbuster. September 23, 2010. Retrieved September 23, 2010. ^ a b Fritz, Ben (April 7, 2011). "Dish Network wins bidding for assets of bankrupt Blockbuster". Los Angeles Times. Retrieved May 2, 2011. ^ a b "DISH Network Completes Acquisition of Blockbuster Assets". DishNetwork.MediaRoom.com. April 26, 2011. Archived from the original on July 17, 2015. Retrieved June 16, 2011. ^ a b Zak, Annie (July 12, 2018). "Alaska's last 2 Blockbuster stores are closing, leaving just one in the U.S." Anchorage Daily News. Retrieved August 29, 2018. ^ a b "Blockbuster Inc. - Company Profile, Information, Business Description, History, Background Information on Blockbuster Inc". Reference for Business. Retrieved January 1, 2017. ^ Weber, Ken (January 6, 2015). "Dear Investor, What the HELL are You Doing? : Smart and Easy Ways to Fix the Mistakes You Make With Your Money". Greenleaf Book Group. Retrieved July 13, 2018 – via Google Books. ^ "Film Lovers Mourn Mockingbird Staple Premiere Video". D Magazine. Retrieved July 13, 2018. ^ "SEC 10-K, 1999". SEC. March 24, 2000. Retrieved June 7, 2017. ^ Poggi, Jeanine (September 23, 2010). "Blockbuster's Rise and Fall: The Long, Rewinding Road". Retrieved July 13, 2018. ^ "The Making of a Blockbuster". Bloomberg Businessweek. Archived from the original on November 13, 2010. Retrieved November 3, 2010. ^ Editors, History.com (2009-11-13). "1985: First Blockbuster Store Opens". The History Channel. Retrieved May 24, 2015. ^ Inc, Nielsen Business Media (October 19, 1985). "Billboard". Nielsen Business Media, Inc. Retrieved July 13, 2018 – via Google Books. ^ "History of Videogame Lawsuits from". 1UP.com. Archived from the original on October 17, 2012. Retrieved June 16, 2011. ^ DeGeorge, Gail (1997). The Making of a Blockbuster. New York: Wiley. p. 32. ISBN 0-471-15903-4. ^ DeGeorge, Gail (1995). The Making of a Blockbuster. Prologue: Wiley. ISBN 0-471-15903-4. ^ Carey, Charles W. (May 14, 2014). "American Inventors, Entrepreneurs, and Business Visionaries". Infobase Publishing. Retrieved July 13, 2018 – via Google Books. ^ David Conn (November 20, 1990). "Blockbuster agrees to buy Erol's chain Curran examining antitrust concerns". The Baltimore Sun. ^ Shapiro, Eben (October 20, 1992). "Blockbuster Agrees to Buy Music Store Chain". The New York Times. ^ Johnson, Ted (September 10, 1993). "Store Wars : Retailing: A busy intersection has become the battleground for three giant music and video outlets. And just up the street, a specialty store is trying to carve out a niche". Los Angeles Times. ^ "Blockbuster Completes Super Club Acquisition". Orlando Sentinel. November 23, 1993. Retrieved October 6, 2018. ^ Sandomir, Richard. "ENTREPRENEURS; WAYNE HUIZENGA'S GROWTH COMPLEX". Retrieved July 13, 2018. ^ Sheridan, Mary Beth (January 10, 1994). "Viacom-Blockbuster merges colorful moguls". Spartanburg Herald Journal. Associated Press. Retrieved February 10, 2012. ^ Fabrikant, Geraldine. "THE MEDIA BUSINESS; Viacom Gets Help From Blockbuster". Retrieved July 13, 2018. ^ Booth, William (August 21, 1994). "REPUBLIC OF HUIZENGA CARVED OUT OF FLORIDA FOR GAMES". Retrieved July 13, 2018 – via www.washingtonpost.com. ^ Gandel, Stephen (October 17, 2010). "How Blockbuster Failed at Failing". Retrieved July 13, 2018 – via content.time.com. ^ "Viacom captures Paramount". Retrieved July 13, 2018. ^ "Viacom Plans Blockbuster Split". Retrieved July 13, 2018. ^ "Viacom's Headache: It's A Blockbuster". Retrieved July 13, 2018. ^ "This block party is for adults only: Blockbuster opens 1st indoor center". Associated Press. Retrieved May 26, 2012. ^ Dan Bloom (November 14, 2013). "Blockbuster to shut a quarter of its UK video and game rental stores and axe 450 jobs after going into administration". Daily Mail. ^ "Blockbuster Identity - Fonts In Use". Retrieved December 26, 2016. ^ "Blockbuster sets meeting on move Video rental chain preparing possible relocation to Dallas". Fort Worth Star-Telegram. November 1, 1996. 1 Business. Retrieved December 18, 2009. ^ Kirkpatrick, John. "Blockbuster to hire hundreds in Dallas office. Two-thirds of Florida workers not moving with headquarters". The Dallas Morning News. March 17, 1997. Retrieved December 18, 2009. ^ Hettrick, Scott. DEJ Deal to First Look. Variety. November 5, 2005. ^ Epstein, Edward Jay (January 9, 2006). "Hollywood's New Zombie: The last days of Blockbuster". Slate. Retrieved March 27, 2018. ^ "Blockbuster Loyalty Put To Test". Retrieved July 13, 2018. ^ "Wherehouse Buys Blockbuster Music for $115 million". Stereophile.com. August 16, 1998. Retrieved June 16, 2011. ^ Schiffman, Betsy (July 20, 2000). "Enron, Blockbuster Partner For Movie Mania". Forbes.com. Retrieved March 28, 2018. ^ "Blockbuster's Broadband-Video Deal Collapses". Los Angeles Times. Bloomberg News. Retrieved October 27, 2016. ^ Leopold, Todd (November 6, 2013). "Your late fees are waived: Blockbuster closes". CNN. Even Blockbuster's late fees came back to bite the chain in an unlikely way. In 1997, a man named Reed Hastings returned a late copy of Apollo 13 to his local Blockbuster. He was assessed a $40 fee. Two years later, he founded Netflix. Blockbuster was caught flat-footed by many of these changes. It could have purchased Netflix for $50 million in 2000, but passed. As Netflix rose, Blockbuster's attempts to compete on Netflix's terms—especially through the mail—foundered. It also tried to compete with Redbox using standalone kiosks. That didn't work, either. ^ Keating, Gina (October 11, 2012). "Netflixed: The Epic Battle for America's Eyeballs". Penguin. Retrieved July 13, 2018 – via Google Books. ^ "With Several Million U.S. Households as Potential Customers, Blockbuster Plans to Capture Substantial Share of Online Rentals" (Press release). Blockbuster MediaRoom. December 31, 2003. Archived from the original on December 1, 2008. Retrieved January 28, 2009. ^ "Blockbuster Launches National DVD and Game Trading Program" (Press release). Blockbuster MediaRoom. October 25, 2004. Archived from the original on December 1, 2008. Retrieved January 28, 2009. ^ "Press Release". sec.gov. Retrieved May 28, 2015. ^ "Blockbuster Ends Bid for Rival". nytimes.com. Retrieved May 28, 2015. ^ "Carl Icahn Wins Seat on Blockbuster's Board – May 12, 2005 – The New York Sun". Nysun.com. May 12, 2005. Retrieved June 16, 2011. ^ Carr, Austin. "Blockbuster Bankruptcy: A Decade of Decline". Fastcompany. Retrieved October 27, 2016. ^ a b c "Blockbuster Settles Over 'No Late Fees'". Billboardbiz. Associated Press. Retrieved October 27, 2016. ^ "About Us - Vintage Stock / Movie Trading Co. - Music, Movies, Video Games and More!". Retrieved December 17, 2016. ^ Sankin, Aaron. "How Blockbuster Almost Beat Netfilx". Retrieved July 13, 2018. ^ Keating, Gina (March 20, 2007). "UPDATE 5-Blockbuster CEO to leave with lower pay package". Reuters. ^ "Blockbuster: Blu-ray In Almost 5,000 Stores". TVpredictions.com. April 10, 2008. Archived from the original on July 20, 2011. Retrieved June 16, 2011. ^ Munarriz, Rick. "Blockbuster CEO Has Answers". Retrieved July 13, 2018. ^ "Blockbuster-Circuit City deal gets thumbs down". Reuters. April 14, 2008. ^ Musil, Steven (July 1, 2008). "Blockbuster abandons Circuit City bid | News Blog – CNET News". cnet.com. Retrieved June 16, 2011. ^ "retrieved 2009-10-04". Blockbuster.com. Archived from the original on July 20, 2011. Retrieved June 16, 2011. ^ a b "The decline of video stores: What we'll miss the most". Retrieved July 13, 2018. ^ Talley, Karen (October 1, 2009). "Blockbuster Plans Expansion To Counter Raft Of Competition". The Wall Street Journal. ^ "Blockbuster Reports Fourth quarter And Full Year Results Revenues Top $6.1 Billion" (Press release). Blockbuster MediaRoom. Archived from the original on December 1, 2008. Retrieved January 28, 2009. ^ "Blockbuster files for bankruptcy in Portugal, and blames internet piracy" (Press release). Engadget. February 10, 2010. Retrieved February 16, 2010. ^ Stempel, Jonathan (April 2, 2010). "Carl Icahn unwinding Blockbuster stake". The Globe and Mail. Canada. ^ Dobuzinskis, Alex (July 2, 2010). "Blockbuster says to delist from NYSE". Thomson Reuters. International Business Times. Archived from the original on July 8, 2012. Retrieved September 26, 2010. ^ James Surowiecki, The Next Level, The New Yorker, October 18, 2010. ^ "Blockbuster Chapter 11 Petition" (PDF). PacerMonitor. PacerMonitor. Retrieved May 2, 2016. ^ Ricker, Thomas (September 23, 2010). "Blockbuster files for Chapter 11 bankruptcy" (blog). Engadget. Retrieved February 19, 2011. ^ a b "Report: Blockbuster plans to put itself up for sale". USA Today. February 11, 2011. Retrieved February 11, 2011. ^ "Blockbuster plans to close 182 stores by April". Reuters. December 20, 2010. Retrieved December 29, 2010. ^ Jeanine Poggi. "Blockbuster Receives Surprise Bid From Korea: Report". TheStreet. ^ Spector, Mike (April 6, 2011). "Blockbuster Auction Gets Under Way With Dish Bid". The Wall Street Journal. Retrieved June 16, 2011. ^ "Dish Network agrees to acquire blockbuster assets". Dishnetwork.mediaroom.com. Archived from the original on July 21, 2011. Retrieved June 16, 2011. ^ Maria Halkias, Dallas News. "Dish Network is trying to keep more than 600 Blockbuster stores open". April 21, 2011. Retrieved April 22, 2011. ^ Joseph Checkler, NASDAQ. "Blockbuster Landlords Want More Assurance, Money For Leases". April 21, 2011. Retrieved April 22, 2011. ^ "Blockbuster Movie Pass: Dish Network's $10/Month Answer To Netflix". Retrieved July 13, 2018. ^ "Blockbuster Movie Pass no Netflix killer". September 23, 2011. Retrieved July 13, 2018. ^ "Dish closing more Blockbuster stores than expected". CNET. CBS Interactive. January 13, 2012. ^ "Dish scraps plans to turn Blockbuster into Netflix competitor". The Verge. Retrieved October 5, 2012. ^ "Blockbuster to End Domestic Retail, DVD By Mail Services". Blockbuster LLC. Archived from the original on March 23, 2017. Retrieved July 28, 2017. ^ Whitney, Lance (November 6, 2013). "Blockbuster throws in the towel". CNET. Retrieved April 1, 2018. ^ Hansen, Jamie (November 6, 2013). "Last Sonoma County Blockbuster to close doors". The Press Democrat. Retrieved April 1, 2018. ^ Hlavaty, Craig (January 29, 2018). "The last Blockbuster Video in Texas has closed". The Houston Chronicle. Retrieved March 14, 2018. ^ "Life After Blockbuster: Catching Up With the Owner of Some". Yahoo News. September 17, 2014. Retrieved May 16, 2018. ^ "List of franchise Blockbuster store locations". Blockbuster LLC. Retrieved June 10, 2017. ^ "Blockbuster @Home". planetdish.com. April 17, 2015. Retrieved May 18, 2018. ^ Kohut, Joseph (March 16, 2014). "The decline of a video rental giant provides warnings of a failure to adapt, innovate". The Times-Tribune. Retrieved May 18, 2018. ^ Padden, Kathy. "This Day in History: October 19th - A Bust". TodayIFoundOut.com. Retrieved May 18, 2018. ^ Hamway, Stephen (April 24, 2015). "Bend Blockbusters among last in country". The Bulletin. Retrieved April 1, 2018. ^ Kirsch, Noah (February 21, 2017). "The Last Video Chain: The Inside Story Of Family Video And Its $400 Million Owner". Forbes. Retrieved April 1, 2018. ^ Gates, Faith (October 25, 2017). "That Moment When You Find Out Blockbuster Still Exists". College Magazine. Retrieved April 1, 2018. ^ Baskin, Jonathan Salem (November 8, 2013). "The Internet Didn't Kill Blockbuster, The Company Did It To Itself". Forbes. Retrieved April 1, 2018. ^ Rodriguez, Ashley (April 28, 2017). "At the edges of America, Blockbuster stores (stocked with actual DVDs) still exist". Quartz. Retrieved June 9, 2017. ^ Tunseth, Matt (June 29, 2017). "Closing Attraction: Eagle River Blockbuster going out of business". Chugiak-Eagle River Star. Retrieved July 2, 2017. ^ Maguire, Sean (March 30, 2018). "South Anchorage Blockbuster set to close". KTUU-TV. Retrieved April 1, 2018. ^ "The Magic of Blockbuster Video lives on with Dish". blockbuster.com. Archived from the original on January 25, 2018. Retrieved May 18, 2018. ^ "Blockbuster Video Stores & On Demand Movies". Dish Network. Retrieved August 8, 2017. ^ Kavanaugh, Shane Dixon (December 3, 2017). "Blockbuster in Sandy, one of 10 remaining in the world, to close". The Oregonian. Retrieved January 4, 2018. ^ Abrams, Abigail (July 12, 2018). "There Will Only Be 1 Blockbuster in America Soon". Time. Retrieved August 29, 2018. ^ "There's 1 Blockbuster left in the US and it refuses to close". New York Post. Associated Press. July 12, 2018. Retrieved August 29, 2018. ^ a b "Australia's last Blockbuster store in Morley, WA closing its doors". The West Australian. March 1, 2019. Retrieved March 1, 2019. ^ Spurr, Kyle (December 29, 2018). "The top local stories of 2018; Central Oregon saw news of the weird, scary and political". The Bulletin. Retrieved January 2, 2019. ^ Spurr, Kyle (September 19, 2018). "Bend filmmakers document the last Blockbuster; When the store became the last one in the U.S., they felt a sense of urgency". The Bulletin. Retrieved January 2, 2019. ^ Spurr, Kyle (March 6, 2019). "It's official: Bend has the last Blockbuster on Earth". Oregon Live. Retrieved March 7, 2019. ^ a b Adams, Nathan (February 22, 2011). "Anyone Want to Buy Blockbuster?". Retrieved April 1, 2018. ^ "Blockbuster signs deal to be exclusive renter for Weinsteins". USA Today. Reuters. November 15, 2006. Retrieved April 26, 2010. ^ Times-News, Cory GalliherCumberland. "Agreement gives Blockbuster exclusive access to new release Warner Bros. films". Retrieved July 13, 2018. ^ Riske, Adam (September 12, 2017). "Riske Business: Do You Dig on Busterverses?". fthismovie.net. Retrieved January 7, 2018. ^ "We Promise You Will Go Home Happy". St. Louis Post-Dispatch. November 6, 1997. p. 75. ^ "Blockbuster nationwide DVD and game trading program". October 28, 2004. Retrieved April 26, 2010. ^ Poggi, Jeanine (September 23, 2010). "Blockbuster's Rise and Fall: The Long, Rewinding Road". TheStreet, Inc. Retrieved January 7, 2018. ^ Susman, Gary (November 22, 2001). "Trophy Case". Entertainment Weekly. Retrieved May 15, 2013. ^ "Viewership uncertainty causes Blockbuster to cancel awards". Berkeley Daily Planet. November 24, 2001. Retrieved May 15, 2013. ^ "NCR Exploring 'Options' for Blockbuster Express Including Sale". Home Media Magazine. Archived from the original on October 30, 2011. Retrieved October 28, 2011. ^ "Blockbuster Express - Cold Bath Road". December 5, 2009. Retrieved November 4, 2014. ^ "Blockbuster goes into administration". January 16, 2013. Retrieved November 4, 2014. ^ a b Kappatos, Nicole (November 15, 2018). "From the Archives: Discovery Zone; a short-lived indoor play zone enjoyed by kids in the 1990s". Richmond Times-Dispatch. Retrieved December 17, 2018. ^ "Blockbuster Australia: New South Wales stores". Only Sydney. Archived from the original on March 27, 2012. Retrieved March 26, 2013. ^ Cresswell, Ellen (April 22, 1998). "Brazin acquires Brashs". ARN. Retrieved March 29, 2013. ^ "Blockbuster Inc. History". Funding Universe. Retrieved March 29, 2013. ^ Turner, Adam (February 23, 2007). "Video Ezy to acquire Blockbuster as rental stores prepare for video download onslaught". iWire. Retrieved March 26, 2013. ^ "Video Ezy takeover of Blockbuster gets green light (19 September 2007)". Smart Company. Retrieved March 26, 2013. ^ Breaking News, AAP (February 24, 2007). "Video Ezy fast forwards with Blockbuster buy". The Age. Melbourne. Retrieved March 26, 2013. ^ Keating, Gina (February 23, 2007). "Blockbuster to sell Australian business to Video Ezy". Reuters. ^ "Media Release: New Name, New Business Opportunities As Stomp Becomes Élan Media Partners" (PDF). Élan Media Partners. October 6, 2010. Archived from the original (PDF) on April 17, 2012. Retrieved September 13, 2013. ^ "MCN Joins Forces With Élan Media Partners To Strengthen Entertainment Offering". MCN. August 28, 2012. Retrieved September 15, 2013. ^ "Sydney's last blockbuster video store is closing down". Daily Mail. July 21, 2017. Retrieved July 13, 2018. ^ Osborne, Kayla (October 4, 2017). "Blockbuster Mount Annan is closing down". Camden Advertiser. Retrieved July 13, 2018. ^ "Australia's oldest video store is shutting up shop in QLD". 4BC 1116. January 18, 2018. Retrieved July 13, 2018. ^ Moore, Tony (February 4, 2018). "Streaming kills the video store as Brisbane's last rental shop closes". Brisbane Times. Retrieved March 1, 2019. ^ Stephen, Bijan (August 29, 2018). "The last Blockbuster: what we really lose when video stores shut down". The Verge. Retrieved October 24, 2018. ^ Hastie, Hamish (4 January 2019). "And then there were two: Morley Blockbuster one of the last in the world". Sydney Morning Herald. Retrieved 4 January 2019. ^ "Morley Blockbuster video store defies the odds and still going strong". March 12, 2018. Retrieved October 16, 2018. ^ Lou, Michelle; Ahmed, Saeed (March 6, 2019). "There's only one Blockbuster left on the planet". CNN. CNN. Retrieved March 7, 2019. ^ Editorial, Reuters. "Retailer Americanas buys Brazil Blockbuster stores". Retrieved July 13, 2018. ^ "Lojas Americanas". February 19, 2015. Retrieved July 13, 2018. ^ Shaw, Hollie (September 23, 2010). "Business as usual for Blockbuster Canada". Vancouver Sun. Archived from the original on September 26, 2010. Retrieved September 26, 2010. ^ "Wind Mobile to partner with Blockbuster". The Globe and Mail. Canada. December 14, 2009. ^ Berkow, Jomeson (May 6, 2011). "Blockbuster Canada goes bust". Financial Post. Archived from the original on May 9, 2011. Retrieved May 9, 2011. ^ Strauss, Marina; Marlow, Iain (August 31, 2011). "Blockbuster to pull plug in Canada". The Globe and Mail. ^ "Milliardgæld truer verdens største filmudlejningskæde". Retrieved July 13, 2018. ^ "Nu lukker Blockbuster butikker". July 17, 2012. Retrieved July 13, 2018. ^ "TDC køber danske Blockbuster". detailfolk.dk. Retrieved July 13, 2018. ^ "TDC: iTunes bliver største konkurrent til Blockbuster test - FlatpanelsDK". flatpanels.dk. Retrieved July 13, 2018. ^ "Fra Blockbuster til RecycleIT til Bluecity - FlatpanelsDK". www.flatpanels.dk. Retrieved July 13, 2018. ^ "Blue City viderefører Blockbuster-koncept - recordere.dk". August 2, 2014. Retrieved July 13, 2018. ^ "Blue City er trådt ud af Blockbusters skygge". RetailNews. Retrieved July 13, 2018. ^ "Blockbuster ist pleite". WirtschaftsWoche. September 23, 2010. Retrieved April 28, 2017. ^ Stewart, Ann (January 8, 1999). "Blockbuster to reopen 15 KPS stores in deal with receivers". South China Morning Post. Hong Kong. ^ "Blockbuster re-employs 145 former KPS staff". Hong Kong iMail (Currently The Standard). Hong Kong. February 22, 1999. ^ Michael, Peter (January 30, 2004). "Blockbuster sunk by pirates, say patrons". South China Morning Post. Hong Kong. ^ "Xtra-vision killed by Christmas sales collapse, court told". Retrieved July 13, 2018. ^ "No sequel as final credits roll for Xtra-vision". Retrieved July 13, 2018. ^ SLATECH. "מועדון יחד - מועדון צרכנות לרופאים -". מועדון יחד - מועדון צרכנות לרופאים - ההסתדרות הרפואית בישראל. Retrieved July 13, 2018. ^ a b חיות, אילנית. "14 סניפי טאוור רקורדס נסגרו; בלוקבסטר הפסיקה לפעול". Globes. Retrieved July 13, 2018. ^ Kelley, Lane (October 5, 1990). "Blockbuster Plans A Move Into Japan". Sun-Sentinel. Retrieved April 7, 2013. ^ "They Don't Call It Blockbuster For Nothing". Bloomberg Businessweek. October 18, 1992. Retrieved April 5, 2013. ^ Kageyama, Yuri (June 18, 1996). "Blockbuster Moving In on Japan's Video Market". Los Angeles Times. Retrieved April 7, 2013. ^ "Examples of Failure for Market Entry into Japan". G-Cross Inc. Archived from the original on November 4, 2012. Retrieved April 5, 2013. ^ "Farewell Blockbuster, here comes The B-Store". September 21, 2015. Retrieved July 13, 2018. ^ "Grupo Salinas pone fin a su tienda de películas The B Store". Retrieved July 13, 2018. ^ Eriksen, Alanah (November 22, 2007). "Sounds, Blockbuster firm's survival bid a first". New Zealand Herald. Retrieved October 16, 2018. ^ "Blockbuster stenger 129 butikker". Retrieved July 13, 2018. ^ "Blockbuster shuts down in Peru, piracy blamed". Reuters. January 3, 2007. ^ "Blockbuster Closing All Its Stores In US; What Will Happen To The Few Stores Left in Latin America?". November 6, 2013. Retrieved July 13, 2018. ^ "About Us". Blockbuster UK. Archived from the original on January 15, 2013. Retrieved January 16, 2013. ^ "Blockbuster's U.K. division buys Ritz Video rental chain. (Blockbuster Entertainment) (Brief Article)". Highbeam Business. February 17, 1992. Archived from the original on May 23, 2013. Retrieved March 29, 2013. ^ a b "Buyer found for Blockbuster stores, say administrators". BBC News. March 23, 2013. Retrieved March 22, 2013. ^ "Blockbuster back in administration". BBC News. October 29, 2013. Retrieved October 29, 2013. ^ "Blockbuster's administrator will close 72 stores". BBC News. November 14, 2013. ^ "Blockbuster to close more stores as 427 more jobs go". BBC News. December 5, 2013. ^ "Blockbuster to close remaining stores". BBC News. December 12, 2013. Retrieved December 13, 2013. ^ "Blockbuster Video Reopens In London... Well, For Two Days Anyway". www.Londonist.com. September 12, 2018. ^ Schiesel, Seth (July 11, 1999). "Jumping Off the Bandwidth Wagon". The New York Times. Retrieved February 17, 2017. ^ "Montana Power, Williams Communications, Enron Units Announce Fiber Providers for Portland-to-Los Angeles Network". PRNewswire. December 17, 1997. Archived from the original on February 17, 2017. Retrieved February 17, 2017. ^ a b Behr, Peter (January 1, 2001). "Broadband Strategy Got Enron in Trouble; Bid to Create Market for Fiber-Optic Space Included Aggressive Accounting". The Washington Post (E01). ^ Blockbuster going after NetFlix CNNMoney. August 11, 2004. Retrieved July 25, 2013. ^ "Blockbuster reports narrowed Q3 loss". Video Business. June 7, 2011. Archived from the original on February 16, 2009. Retrieved June 16, 2011. ^ Associated, The (July 24, 2007). "NetFlix Outlook Gloomy Despite A Profitable Quarter". The New York Times. Retrieved June 16, 2011. ^ "Blockbuster Achieves Year-End Goal of 2 Million Online Subscribers" (Press release). DALLAS: Blockbuster MediaRoom. January 3, 2007. Archived from the original on December 1, 2008. Retrieved January 28, 2009. ^ Mcbride, Sarah (September 16, 2009). "Wall Street Journal, "Blockbuster to Shutter More Stores"". The Wall Street Journal. Retrieved June 16, 2011. ^ "Blockbusted! Local franchisee sues Blockbuster Inc., alleges Dallas company 'undercut' its business – 1/5/2007". Memphis Daily News. Retrieved June 16, 2011. ^ "Accessing the Blockbuster On Demand service on a WD TV Live Product". Wdc.custhelp.com. May 13, 2013. Retrieved November 7, 2013. ^ "Blockbuster On Demand launches on Roku | The Official Roku Blog". February 26, 2013. Retrieved November 7, 2013. ^ Yu, Roger (November 6, 2013). "Blockbuster to close U.S. retail stores, mail DVD operation". USA Today. Retrieved November 7, 2013. ^ "Help – Pay Per Rent Quick Start Guide". Blockbuster UK. Archived from the original on July 20, 2011. Retrieved June 16, 2011. ^ "Band Signup – All Rental Plans". Blockbuster UK. Archived from the original on June 28, 2011. Retrieved June 25, 2011. ^ "The new way to rent – Click & Collect". Blockbuster UK. Archived from the original on October 17, 2010. Retrieved June 25, 2011. ^ "Service Update – Introducing In-Store Exchange / Total Access". Blockbuster UK. Archived from the original on July 15, 2012. Retrieved May 25, 2012. ^ "Service Update – Click & Collect Games". Blockbuster UK. Archived from the original on November 26, 2011. Retrieved November 21, 2011. ^ a b "Blockbuster.co.uk About Us". Blockbuster UK. Archived from the original on June 28, 2011. Retrieved June 25, 2011. ^ "Blockbuster Blog". Blockbuster UK. Archived from the original on August 12, 2011. Retrieved June 25, 2011. ^ "Blockbuster Blog – New Site Features". Blockbuster UK. Archived from the original on March 26, 2012. Retrieved June 25, 2011. ^ "Blockbuster Blog – BB Insider Video 01". Blockbuster UK. Archived from the original on June 8, 2012. Retrieved June 25, 2011. ^ "Blockbuster Blog – Service Update – iPhone App / Mobile App". Blockbuster UK. Archived from the original on March 26, 2012. Retrieved June 25, 2011. ^ "Service Update – Stores: Great Nights In Start with BLOCKBUSTER!". Blockbuster UK. Archived from the original on February 28, 2011. Retrieved June 25, 2011. ^ "Service Update – Pay Per Rent Price Drop". Blockbuster UK. Archived from the original on April 23, 2011. Retrieved June 25, 2011. ^ "The Fighter and True Grit, Exclusive to Blockbuster only £2.99 – YouTube". Blockbuster UK. Retrieved June 25, 2011. ^ "Service Update – Introducing Blockbuster Top Ticket". Blockbuster UK. Archived from the original on April 23, 2011. Retrieved June 25, 2011. ^ "Blockbuster UK Top Ticket". Blockbuster UK. Archived from the original on June 28, 2011. Retrieved June 25, 2011. ^ "Service Update – Introducing Blockbuster Marketplace". Blockbuster UK. Archived from the original on July 19, 2011. Retrieved July 17, 2011. ^ "Service Update – The New Blockbuster Experience". Blockbuster UK. Archived from the original on January 15, 2013. Retrieved September 20, 2011. ^ "Service Update – Full TV Genre Launch". Blockbuster UK. Archived from the original on November 10, 2011. Retrieved September 27, 2011. ^ "Service Update – Top Ticket, £1.50 Rentals, 3D Blu-rays, Click & Collect & Marketplace". Blockbuster UK. Archived from the original on January 15, 2013. Retrieved January 23, 2012. ^ "Blockbuster partners with IGN to promote VIP Gamer scheme". MCV. Archived from the original on May 14, 2012. Retrieved May 11, 2012. ^ "Blockbuster goes into administration Blockbuster said that it was shutting 129 of its 528 stores in the UK". BBC News. January 16, 2012. ^ Neill, Rob (February 5, 2007). "Best Super Bowl ad? Readers pick a Blockbuster". NBC News. Retrieved November 21, 2014. ^ "Blockbuster Sued Over Late Fees". CBS News. February 18, 2005. ^ "Blockbuster settles "no late fees" claims". MSNBC. March 30, 2005. ^ Caroline Mayer (February 19, 2005). "Blockbuster sued over return policy". The Washington Post. ^ Michael McCarthy (February 27, 2005). "'No late fees' ads cause a stir". USA Today. ^ Lorenza Munoz (March 30, 2005). "Blockbuster Settles State Probes Into Late Fee Ads". The Los Angeles Times. ^ Sarah Hale (June 6, 2001). "Blockbuster to settle lawsuit over late fees". The Los Angeles Times, via the Hartford Courant. ^ "Blockbuster customers to be reimbursed for late fees". Fox News. January 11, 2002. Archived from the original on May 18, 2013. Retrieved January 5, 2019. ^ "Kevin Lewis LinkedIn Page". Retrieved July 13, 2018. ^ "Stocks". Retrieved December 17, 2016. ^ "Veteran DISH Executive Michael Kelly announces retirement - About DISH". Archived from the original on December 20, 2016. Retrieved December 17, 2016. Wikimedia Commons has media related to Blockbuster.